AN unseen comedy by Berthold Brecht and a new play by Happy-Go-Lucky star Alexis Zegerman will both receive their world premieres at Hampstead Theatre this autumn. Brecht’s final, unfinished work, Turandot, will top the billing for the autumn season at the Eton Avenue theatre, artistic director Anthony Clark announced last week. For years the play has been purely academic, kept in a thick folio of different drafts and scribbled revisions known as “The Turandot Complex”. Writer Edward Kemp has adapted the play and trimmed the cast down from 50 to 15. Mr Clark will direct. The bold decision to stage it has been enabled by increased Arts Council funding. Hampstead writer in residence Zegerman’s Lucky Seven follows three characters from different walks of life who meet every seven years for an ongoing reality TV show. 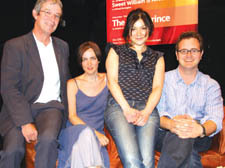 Ms Zegerman, who lives in Camden Town, said: “I wasn’t interested in writing a play about the effect of TV on our lives. Each actor will play all the different ages of the characters, from 7 to 49. Other season highlights include the Royal Shakespeare Company’s Michael Pennington, who will reprise two of his acclaimed one-man shows, Sweet William and Anton Chekhov in November. The Shared Experience theatre company return with their powerful physical theatre in Mine, a new play by Polly Teale.